We all know that parking in the CBD is expensive, but just how expensive. Well I thought I would not only find out, but map it and here are the results. I have included in these maps all of the carparks managed by Auckland Transport, Tournament Parking, Wilson Parking as well as a couple of others that I am aware of. Not all carparks are created equal though, some are just a handful of spaces on a small site where as others are monstrous buildings housing hundreds, if not thousands of parking spaces. It’s hard to give an an average early-bird price as it depends on which sites you include/exclude however in the central city most tend to be in the range of $11-$15 per day. The cheapest park seems to be the surface level carpark behind the Bledisloe building managed by AT which charges a flat fee of only $6 per day. The most expensive is a small Wilson carpark on Swanson St which charges $19 per day. If you exclude the two super cheap AT carparks, the best deal for early-bird parking seems to be at Skycity which is $14 however you can use your ticket to get a free coffee from their Rebo Pronto café on the ground floor. Next I looked at how much it would cost to park in the city casually for two hours. This produced some interesting results (note: there is a different scale). In many of the carparks, especially ones managed by Wilsons, it was actually more expensive to park for two hours than it was to use early-bird parking. 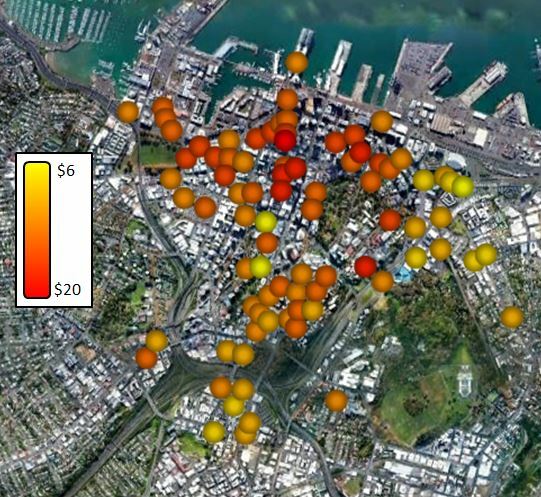 By far the cheapest locations were those managed by Auckland Transport and in many cases they are less than half the price of nearby parks managed by private companies. 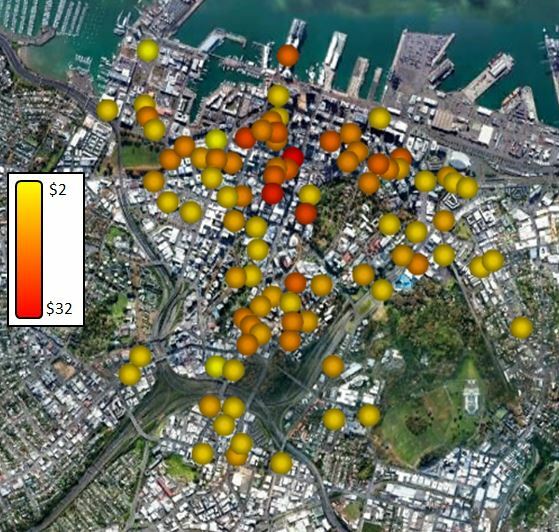 The most expensive place to park is in the SAP tower off Wyndham St which would cost $32 for two hours. Now one of the reasons that the AT buildings are by far the cheapest comes back to a decision a few months ago to deliberately price them that way in a bid to encourage people to use them, rather than on street car parks and was tied in with the new on street parking prices. It was at this time that AT brought forward the early-bird parking time too. In AT’s latest board report there is some information on the impact those changes had. A 19% (41,000) increase in the total casual customer count, from 216,000 to 257,000. Casual revenue decreased $55,000 for the same period, due to the price reduction, offset by increased patronage. Casual customers are on average parking for a longer duration. The average duration in 2012 was 1 hour 30 minutes, while the recent 2013 average duration was 2 hours and 20 minutes. Customers staying less than one hour reduced by 24%. A 30% average decline in Early Bird customers across Civic, Downtown and Victoria Street car parks. A 19% growth in Early Bird customers at K Road car park. In total, revenue for off-street car parking receipts for the quarter reduced by 9% ($226k). The graphs below show the number of customers for each product type since the CCPZ was introduced compared to the same period last year. I will look at the impacts on on-street parking in a separate post. Gah. Pie charts. My eyes. I agree – death to pie charts. I laugh when people add labels to pie charts – you would be much better of having a table where the rows were the categories ordered from largest to smallest. My impression has been that street parking is no easier to get a space than previously, perhaps there’s a higher turnover but in general the streets are as full of cars as usual. This loss of 55,000$ is basically just the council subsidising people to drive in. As you say early bird in my mind would be before 8 or so, after 9 is simply normal commuting time. First: Early Bird is the reverse of how parking pricing should be incentivised. Second: Great to see AT understand the role of pricing in behaviour change. Right time to radically cut the price of off peak Transit tickets to spread the load off the peaks and encourage uptake. Take a fair box hit if necessary, but there is a good chance that it may be revenue neutral or even lift income through pax growth. Certainly it should relieve pressure at the point where it is very expensive to add more services: The Peak. Third: Early Bird is insane. Like the fringe benefit revolt this is just the powerful arranging things to suit themselves at the expense of the rest….. Forth: those two at grade car parks on either side of the Aotea Parking hole make me very angry. This is Motordom in a nutshell. AK ratepayers have built the most expensive parking amenity in the country not once but twice, yet still have to put up with our Council leading the land waste of at grade parking on these two adjacent sites. For decades too. I look forward to the fabulous building design for the Aotea station entrance site on Wellesly and Albert, we’ve earned it. And the other must become much better space to like the square to Myers park. Hint it should include an amphitheatre for outdoor performances, this is the theatre district after all……. I was having a drink at the Basement few days ago when I realized how awful that carparking is and how cool it could be with a link to myers park, with all the theatres around. Nice cars parked there, though. BMW, Mercs, and Jags. AT is increasing PT fares and decreasing parking prices. That’s a bit sad. When the Q theatre went in there was a scheme for a square there instead of parling,and an improved link to Myers park. The idea was to create a sort of indie theatre node. Anyone know what happened? Personally I could see that being a better square than Aotea, enclosed and intimate with good edge activity. 100% agree with that. And the back of those brick buildings is beautiful. I know Q Theatre employees have a certain number of staff parking there, so I guess they prefer to keep it as it is. Bundle them into that damn great underground carpark a few meters away. Recreate the link to Myers Park. Will be even better once the Aotea Station gets built. I went to Myers park the other day from aotea squre and couldn’t believe you had to squeeze through an ugly surface level carpark to get to the [myers] park. This is the centre of town for christ sake, surely there is something better we can do with the land than a surface carpark. The car park immediately screamed out night-food-market to me. Move the cars to the adjacent multistorey carpark, bit of paint on the ground to demarcate the stalls, a few power points for lights, job done. It’s classic price differentiation. Commuters have more elastic demand, As they are likely to be better informed, and prepared to walk further for a cost saving than somebody parking for a few hours every mouth. For the private firms this is logical profit maximization. The one thing I do like about the execution Early Bird parking in the AT buildings is how it only offered on the more distant floors. This means the commuters wind up and down the building once, leaving the better parks for the casual parkers. Making off – street parking more attractive for causal parkers, thereby reducing pressure on the street parking. Looking forward to the on-street discussion and links between the two. Staff parking: so last century. Get real. Not every place of employment has suitable PT close by. I work at a factory where most of the staff work rotating shifts, either 5:45am start or 10pm finish. PT is not an option so staff parking is provided. Why should AT be providing earlybird parking at all? It should be set as before 7am only. AT Parking does not provide earlybird parking, $6 is for 6pm – 6am the next day.